The WiFi Extender is compatible for mainstream routers in the market. If your router is not Xiaomi Router, Please download "Mi Home" APP, click to add equipment, according to the instructions on the app. 1. The premise is you need to ensure the router have been connected with network and you could use it. if you use Xiaomi Router, you need to insert Xiaomi Amplifier into router a few minutes waiting indication light to be changed into blue and kept flashing. 3.Next download official Xiaomi app named "MI Home" from app store, please process it according to the indication formed and connect between amplifier and router. Likewise, so far you only need to wait the indication light to be turned into blue and kept flashing, then all is done. 1. If you can not find the xiaomi W-IFI repeater 2 device on your App, please change you locate into Mainland or other. 2. Please use 2.4G, do not open 5G, make sure the SSID is total English, WiFi password encryption method required for WPA / WPA2, wifi signal should not be hided, please check the network settings. Wifi name should be total English and should not include any symbols and spaces, if include symbols and spaces，please update wifi name into the router's background. please keep your router，phone，and device close to with each other，no more than 1 meter. 3. 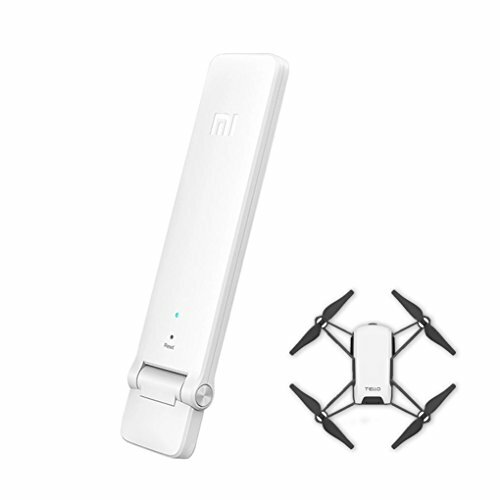 It can work well with drone, but it need a network with a password, if there is no network with a password for your drone, Please try to make up a fictious password to proceed to set up, Once completed your drone signal will be increased. Built-in 2 antenna, transmission rate could up to 300Mbps. 180° rotation USB interface, easy to find best direction to place. Compatible with most routers, it is easy to set up and pair, If you use this outdoor, please plug it to a power bank.